In this episode, Emily interviews Bailey Poland, a rising second-year PhD student in rhetoric and writing at Bowling Green State University. Bailey earns a stipend of just $14,000 for the academic year, but manages to live a comfortable life thanks to her disciplined budgeting and two side hustles. 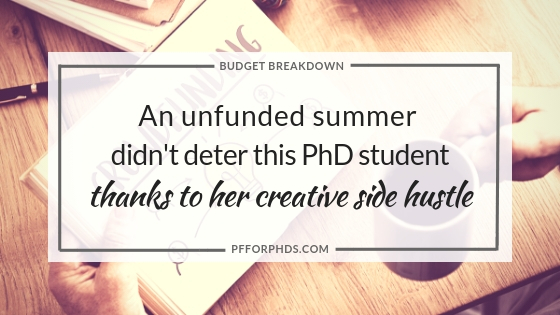 Unlike many of her classmates, she devoted her first summer as a PhD student exclusively to research, relying on her side hustle income and savings from her stipend to tide her over until the next academic year started. Emily and Bailey discuss in detail Bailey’s housing choice, frugal habits, and unique Patreon side hustle that complements her graduate work. Bailey Poland is a second year PhD student in the Rhetoric and Writing program at Bowling Green State University. Bowling Green is a city in Ohio, located to the south of Toledo, Ohio. Bailey’s stipend is $14,000 per academic year. Additionally, Bailey earns $460 per month from Patreon and $150 quarterly from copy-editing a music magazine focused on Texas. She is the only person in her household. Bailey’s PhD stipend does not include summer funding. She budgets savings over the academic year in order to meet her expenses over the summer. 3:25 Q2: What are your five largest expenses each month? Bailey’s largest expenses are rent at $600 per month, car payment at $200 per month, health insurance and fees at $400 per month, food at $150 to $200 per month, and car insurance at $112 per month. Bailey rents a two bedroom apartment for $600 per month. She says this rate is higher than other options available in Bowling Green. She looked at options for rent at rates of $350 to $450 per month, but these apartments were in poor quality or clearly undergraduate housing. Bailey used to own a house, so she approached her apartment search with those expectations. Bailey’s apartment is in downtown Bowling Green. She walks to campus, so she doesn’t use her car or have a university parking pass. She drives to the grocery store, but she lives above a coffee shop. She thinks she is in the perfect location. She lives by herself in the two-bedroom apartment, so she sleeps in the smaller bedroom and uses the extra bedroom as her office and library. Bailey pays $200 per month for her car. She has a 2017 vehicle that she bought new. She traded in her older Toyota Corolla when she bought her new car. Due to unfortunate family circumstances, Bailey received money from inheritance and estate closure. She used this money for her car payments. She has stayed ahead of interest and has gotten ahead on payments. Bailey pays health and insurance and fees in lump sums a couple times a year. The amount works out to about $400 per month. She uses her credit card to make the payment at the start of each semester, but she pays it off immediately. Her credit card pays back 1.5% so she received a small kickback. Generally, she doesn’t keep a balance on her credit card so she avoids interest payments. She made her first health insurance and fees payment before she received any of her graduate school stipend. Because she formerly worked as a marketing analyst for global HR and payroll company, she had enough savings available to make this payment when she started graduate school. She chose to go to graduate school because she was much happier in a classroom than behind a desk in a corporate office. Bailey pays $150 to $200 per month for food, which includes groceries and dining out. She plans and prepares meals ahead of time. She cooks two or three times a week and freezes leftovers. She takes food with her to campus. She has a limited set of go-to recipes. One of her favorites is chile garlic tofu. She says the meal is filling and takes half an hour to prepare. She gets four meals from one block of tofu. She eats lots of eggs, pasta, and rice-based meals. Her vegetarian cooking has increased since she started PhD program. Bailey learned meal preparation from trial and error in the first few months of graduate school. She figured out which meals took too long or she didn’t like enough to have leftover. She used the Budget Bites website to find recipes. She cooks on the free nights of her week, because she knows which nights she’ll want to eat dinner as soon as she gets home. Bailey is on campus from 8am to 6pm most of the week. The latest she gets home is 7pm or 8pm. She takes lunch and a small snack with her to campus, and she eats dinner at home. When Bailey purchased her new car, her car insurance rate increased from $85 per month to $130 per month. She has a plug-in for diagnostics of her driving habit, which lowered her insurance rate to $112 per month. She only regularly drives to and from the grocery store, which is a 10 minute drive. She also drives to her mom’s house, which is 30 minutes away and all highway driving. Bailey says graduate students can get by without a car in Bowling Green. In her PhD cohort, at least one person doesn’t have a car. Busses run regularly to and from campus. Grocery stores deliver for a fee. Local activities are accessible to pedestrians. Bowling Green does not have cabs, Uber, or Lyft. It is pretty rural. Bailey needs a car to leave town to see her family. 18:10 Can you tell us about your side hustles? Bailey has two separate side hustles. For one, Bailey copy edits a magazine about the country music scene in Texas. She missed doing copy-editing work, so she posted on Twitter that she was looking for an opportunity. Someone from the magazine responded to her and said they’d pay her to copy edit. Bailey has had this side hustle for three years. She receives $150 every few months and she has learned a lot about a topic that is unfamiliar to her. For another, Bailey uses Patreon, the crowdfunding platform for artists and creators. She receives $460 each month from Patreon. She got started after she defended her Master’s thesis and she quit her corporate job earlier than she had planned. She was working at a bookstore and she needed more income. Some of her friends had Patreon, so she was familiar with the platform. Bailey started by doing live readings of The Rhetorical Tradition, like live tweeting her readings with funny commentary. People got invested in her live readings and she transitioned the activity to Patreon. Reading The Rhetorical Tradition was a really long project. She planned in advance and read as much as possible during the summer so she wouldn’t need to read during her first graduate school semester. She planned to post about The Rhetorical Tradition on Monday and Friday, post photos of her mom’s three cats on Tuesday and Thursday, and post an essay style blog post on Wednesdays. She only writes one or two truly new posts per month. With her PhD work, she doesn’t have time to write four or five new posts a month. Recently she has started a new reading series that overlaps with her prelim list for her PhD. She is gaining familiarity with texts in her field, having interesting conversations with her patrons, and making some money. Bailey has created a very niche platform. Starting a Patreon was a huge leap of faith. She used to be super active on Twitter with a group of 18,000 followers. She authored a book, which helped her gain an audience invested in her thoughts. She trusted that her audience would move with her from Twitter to Patreon. She front loaded the work during the summer, so during her first semester it was more like a passive income stream. Now it serves multiple purposes for her. She finds it fulfilling that her academic work is accessible to the public. Her work lately is archival, and through Patreon she can share what it’s like to work in an archive. Bailey finds joy in her patrons and appreciates that they pay for her to do this work. 26:35 How do your colleagues react to your side hustle? Do they take on side hustles? Bailey says her colleagues know and are supportive. For example, Bailey did a public series on Patreon that was a reflection on teaching practices she learned at Bowling Green. Her program’s website’s homepage included a link to her series. Generally, PhD students are discouraged from outside work because they should focus on doctoral work, but her department gives no formal prohibition of outside work. Most other graduate students have some other work, though it may not be talked about. During the summer, other PhD students in her department find jobs. Some find online teaching roles, and one is working in the garden center at Lowe’s Hardware Store. One is going to a writers retreat that comes with a stipend. PhD students with spouses don’t work or find part time work. 29:28 Q4: What are you currently doing to further your financial goals? Bailey has a 401k from her corporate job that she will roll into a Roth IRA over the next few years. She has investments with Betterment that serve as her long-term emergency funds. She has a high earnings online savings account as her primary emergency fund. Her goal is to have three months of expenses saved, and she is $600 short of her goal. Generally, her goal is to have her retirement well planned. She wants to be in academia long term, but she can’t be certain about this path. She wants security and confidence during her job search. Having savings going into graduate school frees up opportunities. During her first summer as a PhD student, Bailey is working on archival projects and taking a class. During the school year, Bailey has multiple things going on, like classes, teachers, committees, conference planning. Summer is really valuable to devote focused attention to a project. In subsequent summers, it is possible she will take teaching jobs. 34:30 Q4: What don’t you spend money on that might surprise people? Bailey doesn’t have student loans. She paid all of her loans within two years after undergrad. She hasn’t taken out any loans for higher education. Because she went to a State school, had scholarship, and finished in three years, she had very manageable loans from her undergraduate education. She took a job after college right away. She doesn’t spend a lot on hobbies. She likes to cross stitch. This is inexpensive and takes a long time. She can spend $20 on one project that entertains her for five months. She has hobbies that help her relax and are not difficult for her budget. 39:00 Q5: What are you happy with in your spending and what would you like to change? Bailey’s rent is higher than she wants to pay and is more than what others pay. She negotiated for lower increase rate when she renewed her lease. She’s considering doing a spending fast over the summer because she has no stipend coming in. She wants to minimize the hit that her savings is taking. She can find entertainment in Bowling Green for free. For example, there is a huge arts community and a massive arts festival. 42:12 Q6: What is your best advice for someone new to your city who is budget-conscious? Bailey recommends that someone new to Bowling Green shops around for a place to live. There a lot of good options. Graduate student housing is affordable and it is easy to find a roommate. She says to look for an apartment as early as possible. She started looking in July, which limited her options. She would have looked earlier if she knew. She advises new PhD students in Bowling Green to plan on saving. She says make sure you have cushion before you get here. Graduate school is stressful enough without living paycheck to paycheck. You should get rid of debt completely if you can. 44:22 Q7: Would you like to make any other comments on what it takes to get by where you live on what you earn? Bailey says it is definitely possible to live in Bowling Green frugally and have a good time. She says there is always stuff happening that’s free or inexpensive. Toledo is a twenty to thirty minute drive. It may not be possible to live on the stipend alone, but you don’t need much more. Bowling Green has a low cost of living and is a college town invested in the university community. On this episode, Emily interviews Nicholas Giangreco, a bioinformatics graduate student at the Columbia University Medical Center. Nick’s expenses in Manhattan are relatively high – such as spending over 50% of his net income on rent – but his stipend still allows him to spend on his priorities and still save money consistently. 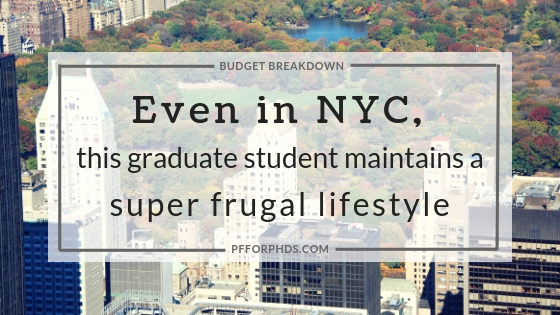 Nick lived very frugally while he was paying off his student loans prior to grad school, and now applies his thoughtful budgeting skills to enjoying life in Manhattan without breaking the bank or detracting from his research. Nick Giangreco is a bioinformatics graduate research assistant at Columbia University Medical Center in New York City. He started his program in August 2016. His post-taxes pay is approximately $1,300 biweekly. 2:58 Q2: What are your five largest expenses each month? Nick’s top expense categories are rent, health, transportation, and food. His miscellaneous and entertainment expenses are considerably low. He uses a spreadsheet to monitor his spending. Nick lives in a studio apartment located on-campus and managed by the university. He pays $1,200 for his studio, which is lower than nearby off campus studio apartments that are $1,500 to $1,600 rent. Nick recognizes that he could find housing options near campus for less than $1,200 monthly rent. He mentions his friends who share four bedroom apartments and each pay $600 for their room. Finding a place in New York City is challenging. If you don’t find somewhere on Craig’s List, you may need a broker and to pay the broker fee. Nick says the majority of graduate students live on-campus. To accommodate the demand for on-campus housing, the university has three tiers of priority consideration for housing applicants. The first priority tier is international students, the second tier is students from outside the New York – New Jersey – Connecticut Tri-State area, and the third tier is students from within the Tri-State area. According to Nick, living on-campus makes graduate student life easier. Nick has a 15 minute walk to work, and he avoids commuting on the subway. The university gives current residents the first priority to renew leases. Nick plans to renew his lease for his on-campus apartment. Nick spends a few hundred dollars per month for pilates sessions. He sees a personal pilates trainer in the West Village and pays $100 per session. He goes to physical therapy and rehabilitation at the hospital at Columbia. The copay is $20, which adds up since he has an appointment every week. Nick’s health insurance does not cover his pilates session, but he likes his personal trainer and gets value out of the sessions. He first tried going to pilates classes at the university’s gym for no charge, but he was dissatisfied with the generalized approach of group classes. He wanted something personalized for his needs, so it is his priority to budget for pilates classes. Nick estimates that he spends $200 to $300 per month on transportation and travel, or as little as $100 in a month if he doesn’t leave New York City. He puts $20 on his subway card and adds as needed. Additionally, he takes taxis and Ubers to get around Manhattan. Though taking a taxi to the JFK airport can be expensive ($70), the subway takes two hours. He uses Amtrak to go to his hometown, but those tickets add up. He also looks for cheap tickets from Megabus. Nick spends less than $200 per week on food. In his studio apartment, he has a kitchenette which has a stove but no oven. He doesn’t buy groceries that require baking. He buys non-perishables and items that keep well. Some of his go-to items are sweet potatoes, oatmeal, and popcorn. He takes out $20 per week in cash for use at the food trucks, which only accept cash. He buys gyros for $5 and coffee for $1 from the food trucks. He goes to restaurants or diners once or twice a week. Nick looks for free food from graduate school events. He is part of a Slack group for graduate students in the department, where people share information about free food. He eats food at seminars, lectures when alumni are invited, and club events. Nick’s kitchenette does change how he approaches his food budget. When he lived in Washington, DC, he lived in a house with a kitchen. He used to batch cook on the weekend and set aside portions of leftovers for the week. He would host friends for meals. In New York City, he doesn’t have room to host anyone and can’t cook very much. He microwaves sweet potatoes and makes rice and beans on the stove. He keeps leftovers from events. He doesn’t plan his food for the whole week, instead he plans by the day. Nick thinks he could plan better, but right now he needs to focus on his PhD work so he needs the convenience. Nick says there is a lot to do in New York City. He doesn’t spend much money on entertainment because he does a few cheap activities. He goes to clubs and university events. He sees plays for $10 on the Columbia Medical Center campus. He saw Spongebob the Musical for $30. Though Nick has friends who go out for drinks every day, Nick doesn’t buy much alcohol. 33:30 Q3: What are you currently doing to further your financial goals? Nick recently paid off all his student loans. Before starting his PhD, Nick lived in DC for two years. He lived a very frugal lifestyle, and took two and a half years to pay off his student loans. Now, Nick is working on his rainy day fund so he can create a financial cushion in his budget. He spends about $2,300 per month of his $2,600 monthly income, so he puts the rest to savings. Nick keeps a budget in google sheets to log his expenses. He wants to become conscious of his spending habits. He is looking into passive investing approaches and learning about retirement. Columbia Medical Center provides graduate students the option to invest with Vanguard. Though there is no matching offer, he determine an amount to withhold out of his biweekly check. He called the financial office and asked explicitly about this retirement program applicability to graduate students, and he is considering it. Nick tries to save $100 to $200 per month for his rainy day fund, and wants to increase this to $300 to $500 per month. 39:14 Q4: What don’t you spend money on that might surprise people? Nick doesn’t spend much money on entertainment or alcohol. He takes it seriously that he is in New York City for graduate school, so he prioritizes his studies and his work. He doesn’t go to Brooklyn or the East Side, instead he goes to Central Park for free and finds cheap shows at comedy clubs. He uses the subway because this transit option is $20 to $30 less than taxis and Ubers. He will listen to podcasts while he’s on the subway. 43:07 Q5: What are you happy with in your spending and what would you like to change? Nick is happy with his food spending and his entertainment spending. He has a social life and indulges in brunch with friends on the weekends. He wishes he could save more on rent, but he doesn’t want the responsibilities that come with living in a house. Landlord, roommates, and housing infrastructure problems add extra stress that he doesn’t want to deal with. He wants to concentrate on graduate school, and his studio apartment helps him focus. He also appreciates the security in his building, the community and the convenience. He lives on-campus and one block away from the subway. Ultimately, the convenience of the location is worth the high rent. 46:42 Q6: What is your best advice for someone new to your city who is budget-conscious? Nick recommends living on-campus. He thinks the Columbia Medical Center bioinformatics graduate program pays well. He says the initial payment for first years is nearly $20,000 as a lump sum, which needs to be budgeted carefully. The Columbia Marketplace Facebook group is useful to find free and cheap items. The Grad Talk list-serve helps you find out about free and cheap items as well. Nick says to enjoy yourself without going crazy, and to be mindful. 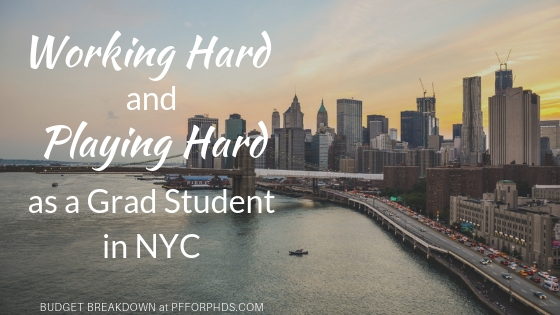 Anyone considering New York City for a PhD program should know that grad school can be intense, New York City can be intense, but this is a time to work really hard while making good friends and good memories. Nick coordinates a Meetup group and leads an NYC chapter of an international organization. New York gives you access to broader networks and opportunities. 51:38 How do you budget your biweekly pay? How does it compare to other pay structures? Nick used to work at the National Institute of Health in DC, where he monthly check. The biweekly pay does not change how he budgets, instead he enters his income twice a month into a spreadsheet instead of once a month. He had enough cushion money in his account to manage expenses, and knows that he will get another paycheck in two weeks. His spreadsheet helps him keep track. 55:41 Q7: Would you like to make any other comments on what it takes to get by where you live on what you earn? Nick says it’s a great time to be a graduate student in New York City. So many people like to visit New York City, so it’s great for spontaneous reunions with friends. It’s easy to get out of the city if you want. New York City offers many opportunities, and you’ll interact with people from multiple universities, companies, and form a broad network. In this episode, Emily interviews Athena Pierquet, a rising second-year graduate student at New York University in English. In her first year as a PhD student, Athena lived on her $28,000 per year fellowship and save all of her smaller income sources, but her finances are facing a new challenge as she transitions out of subsidized university housing. Despite living in Manhattan, Athena maintains a very frugal lifestyle, minimizing her spending on groceries, transportation, entertainment, and recreation. Athena is a rising second year PhD student in the Department of English at New York University. She lives in the Manhattan neighborhood Stuyvesant, or Stuy Town. Her overall income was $38,000 from several university sources. Most of her income comes from the MacCracken Fellowship, provided for all NYU PhD students, which was $27,526 this past year. She received a housing stipend of $5,500. Several scholarships and grants made up $4,000 of her income, and short term research contracts made up $1,000 to $2,000. 2:20 How is your income reported for taxes? For taxes, Athena has to self report the MacCracken Fellowship and her other scholarships to the federal government. The university provides her a 1098-T form for taxes. Her short term research contracts are reported on W-2, but these are a minor part of her income. 4:08 Q2: What are your five largest expenses each month? Athena’s five largest expenses are rent, food, books and supplies, incidentals, and going out for fun. Athena pays $1,100 per month for rent. This cost includes all utilities, except for internet. She shares a two-bedroom apartment in Stuy Town with another first year NYU PhD student. The market rate for her apartment is $3,500 per month, but since the apartment is in a university housing complex, the cost is subsidized by the university. However, university housing is only available to first year PhD students, so Athena is searching for new housing in Manhattan. For her new housing search, Athena’s budget is $1,200 to $1,300 for a room in a three or four bedroom apartment. NYU will continue to provide a housing stipend of $5,500 during her second year, but in subsequent years the housing stipend will be replaced with income from teaching classes. In general, her income does not increase to cover the new housing costs. Athena saved much of her income from her first year in anticipation of her move into the cut throat Manhattan housing market. To get an apartment in Manhattan, she needs $3,000 to $5,000 available. Securing an apartment requires payment deposits for first month’s rent and last month’s rent. Athena’s food budget is $100 per week. This category broadly covers anything she purchases to eat. She includes groceries, coffee shops, restaurants, and take-out in her weekly food budget. She plans out her meals and makes grocery shopping a priority. She makes almost all of her food at home and describes some of her meals, such as fully loaded oatmeal and hearty, entree salads. Athena eats at restaurants only two or three times each semester. She has several frugal tips for going to restaurants in Manhattan and getting free food from NYU events. Athena’s spending on books and course supplies is about $300 per semester. Her expenses for books and course supplies are considered non-taxable income. As a literature student, she needs many books for her work. She estimates that if she bought every book she needed or wanted, she would be spending thousands of dollars. She frequently borrows from the library, gets used books, and finds resources online. Nonetheless, this was tricky to budget for because of different needs for different courses. Athena budgeted for unexpected expenses, which she describes as the impulsive book purchase, miscellaneous fees, and spontaneous entertainment. Since she set her budget week by week, she intentionally put $45 each week for incidentals. Typically, she only had one or two unexpected expenses each month. The miscellaneous category is a place to lose money if you’re not careful, in Athena’s opinion. Athena later learned that the $45 per week that she budgeted for incidentals was really what she needed for taxes. When Athena began first year of graduate school, she didn’t know how much to set aside for taxes. NYU does not withhold taxes for U.S. citizens in their PhD programs, so it was Athena’s responsibility to estimate how much she might owe in taxes and plan for tax season. This is a challenge faced by many PhD students receiving fellowship funding. Athena budgeted $20 per week for going out, and spent $280 over one semester on happy hours and other social events. She went to bars with friends about once or twice a month for happy hour, where she would socialize for two or three hours. In her budget, Athena distinguishes drinks at a bar or restaurant from purchasing a bottle of wine or six pack from the store. She notes that at NYU, she has plenty of opportunities to enjoy free drinks and free food at events sponsored by the institution. 34:36 Q3: What are you currently doing to further your financial goals? Athena tries her best to live within her means. She only lives off of the MacCracken fellowship, about $28,000, which is her only guaranteed income source for 5 years. She puts her other fluctuating funding sources into savings and does not create her budget from it. Athena has a healthy cash savings account, and every now and then she moves it into an investment account with Vanguard for retirement and index funds that could be used for major purchases in 20 to 40 years. She needs her cash savings for her new apartment, new furniture, and irregular expenses. 38:19 Q4: What don’t you spend money on that might surprise people? Athena doesn’t spend money on transportation. If it’s less than an hour walk, she will walk to the distance. The $2.75 to take the subway or bus is better spend on coffee, in her opinion. She won’t take cabs or ride share unless she absolutely has to. She makes use of public spaces with internet access and working spaces, like the New York Public Library. Some people pay memberships to writers’ rooms and co-working spaces, or even a desk at home, but Athena has a list of go-to public spaces to work remotely. Additionally, Athena doesn’t have a gym membership, and she won’t go to exercise classes. She avoids shopping and costly activities. Though she’s surrounded by high income earners in Manhattan, she reminds herself that she has more important priorities than the high expense lifestyle. 43:56 Q5: What are you happy with in your spending and what would you like to change? Athena would like to change how she tracks her cash spending. Since some places are cash only, and some only take cards, Athena finds it tricky to document all of her expenditures. She’s happy with how little she spends on exercise activities. Athena is a long distance runner, so she makes use of the long trails and paths throughout New York City. She has a deeply discounted New York Roadrunners membership, and recommends that others look into student discounts. 47:36 Q6: What is your best financial advice for a new PhD student at NYU who is budget-conscious? First, Athena says that budgeting and spending conservatively is absolutely a must. Many daily necessities, like laundry and groceries, are more expensive than you might expect. Second, she says do not buy in bulk! Buying only what you need will save money in the long term, as well as save space in small apartments. Athena recommends being aware of how you will be funded through the summer. In some cases, you will receive payments for only the nine months of the academic year. Some refer to the first summer after graduate school as the “summer of poverty,” so think about this when you get your offer letter. You may need to save during the academic year to get through the summer, or find summer work. Make plans at the beginning of the academic year. 52:49 Q7: Would you like to make any other comments on what it takes to get by where you live on what you earn? Athena says you need to be honest about your financial situation. Seeing wealth around you in NYC does not mean you need to spend like that too, or emulate what you see people doing around you. Athena takes the initiative to suggest more frugal activities, like going to coffee or happy hour instead of more costly brunches and dinners. Athena does an end of the semester assessment of her budget that she finds highly valuable. She evaluates how she spent her money and considers how she can do better the next semester. It can be difficult to anticipate how expensive things will be ahead of time, so she has gone through a process to try things out and reassess her expenses.